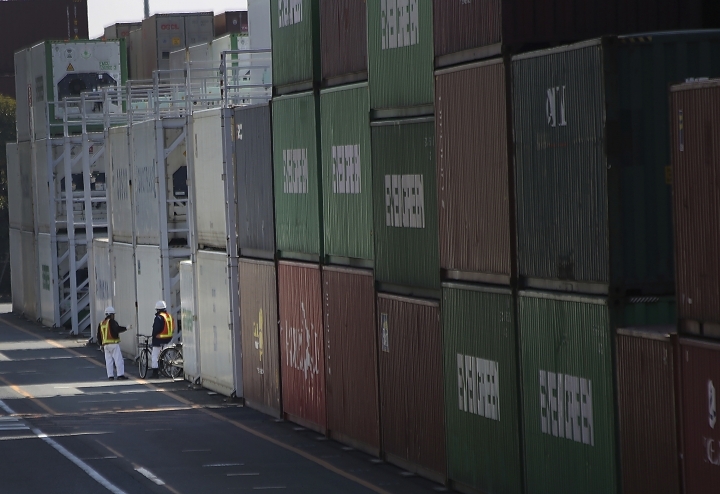 TOKYO — Japan recorded a trade surplus for September of 139.6 billion yen ($1.2 billion), but exports fell 1.2 percent from the previous year in the first decline for the world's third largest economy since 2016. A series of natural disasters took a toll, but the lag in exports also reflects uncertainties over trade tensions after President Donald Trump imposed penalty tariffs on billions of dollars' worth of Chinese exports. Weaker U.S.-China trade generally hurts the export-dependent Japanese economy. Imports rose 7 percent, according to data released Thursday by the Ministry of Finance. During the month, a major earthquake hit the northernmost island of Hokkaido, causing fatal landslides and widespread blackouts, while a typhoon struck the western Kansai area and temporarily shut down a major airport. Those events followed deadly flooding in southwestern Japan and a quake in Osaka earlier this year. The last time Japan's exports fell on-year was in November 2016, when they slipped 0.4 percent, data show. For the six months through September, the first fiscal half, exports grew 5.2 percent, while imports rose 10 percent. Junichi Makino, analyst with SMBC Nikko Securities, said one factor behind the numbers was the recent rise in oil prices, which boosts the value of Japan's imports. Japan imports almost all its oil. But Makino said the volume of global trade was holding up overall despite the trade war between China and the U.S. The Trump administration intends to pursue trade agreements with the European Union and Britain, as well as Japan. The administration recently reached a deal with Canada and Mexico to revamp the North American Free Trade Agreement.